The Marlborough Sounds at the top of the South Island of New Zealand is a treasure most only see when they sail into Picton on the InterIslander Ferry from Wellington. This is a beautiful trip, but to get the full magic of the Sounds, you need to explore the other less frequented sounds such as Queen Charlotte – via the Famous Walkway, or via a boat trip. We have done the walk before, so our choice on this trip is to do a trip on the larger Pelorus Sound. 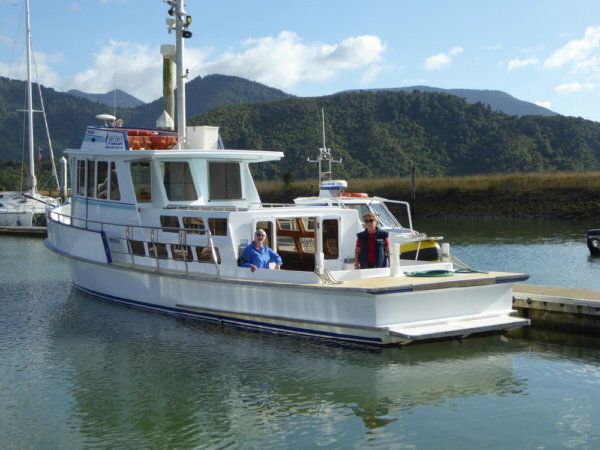 We have booked a full days trip with Pelorus Tours to Te Pakeka Maud Island – a predator free conservation island in Pelorus Sound. 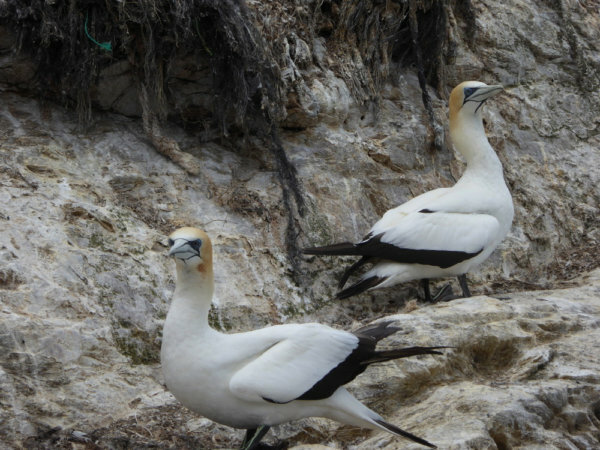 A gannet colony is one of our stops, where the wildlife seem uninterested in us as we draw alongside, apparently fearless because we are on a boat. There is a tiny fluff ball of a chick, some midsize fluff balls and several fledglings testing their wings getting ready for flight. We are downwind of them, so we get the full blast of their ripe guano before powering on with our trip to Te Pateka. This was definitely a highlight of the trip. 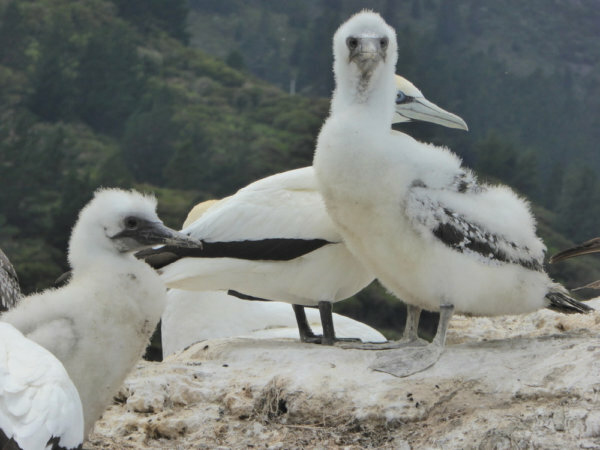 Maud Island has been a conservation island since the 70s, and is a scientific reserve. 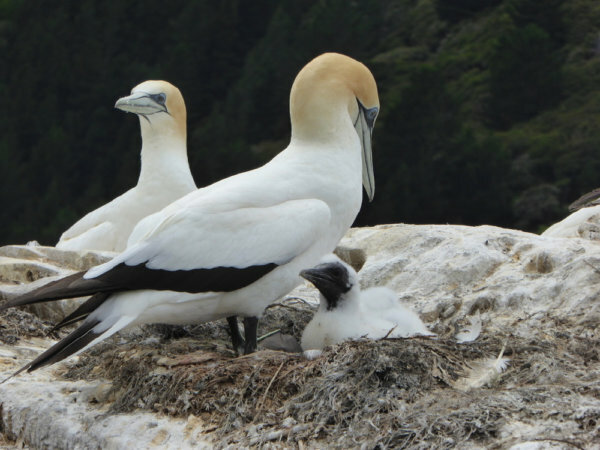 Several Department of Conservation staff live and work (with their young family) on the island, which is home to hundreds of rare species. 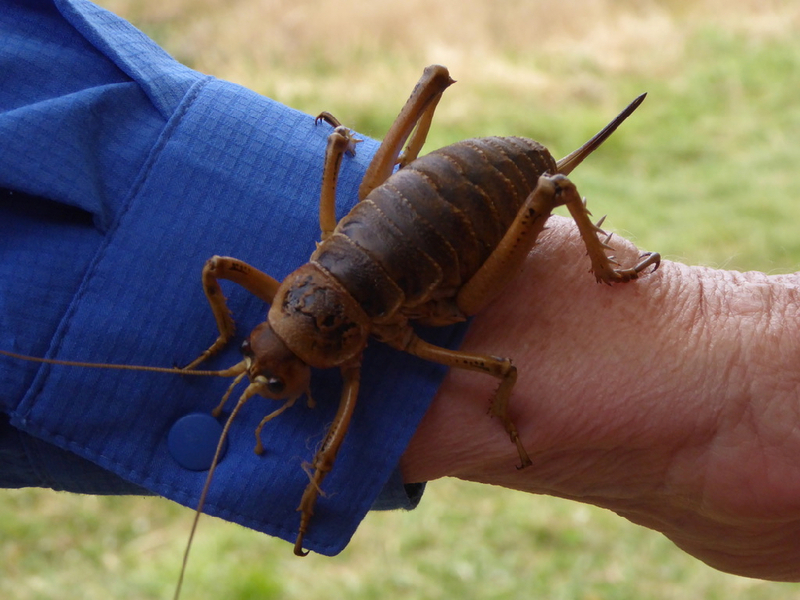 We are welcomed with song and are soon introduced to frogs, skinks, gecko and some magnificent giant weta who happily climb all over us. They all thrive on this island which has never had possums or rats. We are told the history of the island and how efforts to control and eradicate pests remains an ongoing challenge – mice have recently re-established themselves and are the next targets for eradication. The beautiful Marlborough Sounds is definitely a must-visit place in New Zealand. We definitely recommend a cruise to Te Pakeka Maud Island. thanks for that – loved our trip!